WASHINGTON (Nov. 01, 2010) -- The under secretary of the Army visited Pine Bluff Arsenal, Ark., as part of an exploratory effort to better understand the industrial capability of the Army's arsenals and depots. 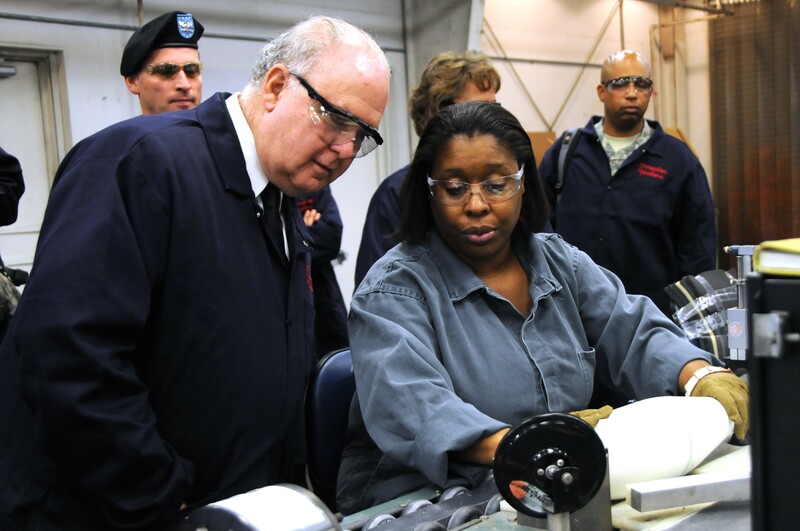 "Part of this visit was to see what is the capacity and capability of the arsenal -- what is the nature of the workforce," said Under Secretary of the Army Joseph W. Westphal of his Oct. 28 visit. Under Secretary of the Army Joseph W. Westphal talks with workers who assemble 120mm illuminating cartridges at Pine Bluff Arsenal, Ark. As the chief management officer of the Army, the under secretary said he's interested in learning more about the Army's industrial facilities. "The question now is how efficient can we make them (and) how inefficient will they become if we don't bring enough work to them," he said. "So for example, if you take a bunch of work out of a particular arsenal, like Pine Bluff, the cost of work will increase, and so their customer base will (have) a problem." Arsenals like Pine Bluff are permanent Army facilities, and have fixed costs associated with maintaining them. If their workloads are not sufficient enough to offset the cost of maintaining them, the Army loses money keeping them open. "We need to look -- is there a way to mitigate that by taking excess work from somewhere else and shifting it around," Westphal said. The Army doesn't yet have a plan in place to do that, but Westphal's trip is part of his effort to better understand what the Army has, so he can be prepared to build such a plan. "(We're) getting ready to look at the need to produce ... more of a master plan, a strategy about how we are going to address changes in capacity and funding," he said. Pine Bluff is one of several dozen facilities across the United States that produce, repair or reset the tools Soldiers use to fight America's wars. At Pine Bluff Arsenal, for instance, the Army manufactures more than 135 products. Those products include chemical protective equipment such as the M40 and M45 series masks, ammunition like the M18 and M83 smoke grenade, and both visible light and infrared illumination shells such as the M485 155mm illuminator and the M816 81mm infrared illuminating cartridge. During his visit, the secretary visited facilities that manufacture M930 120mm mortars, M40 protective masks, and white phosphorus illumination shells. The arsenal also repairs equipment like the chemical-biological protective shelter and the chemically protected deployable medical system. Demand for such devices is not enough to spur interest in the private sector, so the Army maintains the capability of producing those items on-demand when they are requested. "When we come to the end of a war like this and we need less of something, the private sector will move to something else," Westphal said. "We must be able to produce something should we have to use it in the future. So we want to maintain the capacity." Westphal also said the Army remains mindful of ensuring it does not compete with the private sector. One major change at Pine Bluff Arsenal is the phase-out of the chemical weapons demilitarization mission there -- which employed about 1,100 individuals. Those employees include about 350 Army civilians and 750 contract employees. The chemical weapons demilitarization mission phase-out begins in December. The under secretary met with civilian employees at the arsenal as part of a town hall meeting. During the meeting, the secretary discussed his plans for Army civilians to have career paths similar to what is available for Soldiers. "I want to be able to put everybody that is a federal employee who works for the Department of the Army on a career pathway," he said. "We have many of those, but we have a lot of people who are not on a career pathway, (but) who have generalized descriptions. They have a job and they are doing well, but if they want to move up the pyramid, there is no pathway. I want to create professional development and leadership education for our workforce just like the military." The secretary said that when employees need to leave a position to pursue education in order to move forward in their careers, the Army's civilian workforce must be poised to backfill that slot with another employee who is capable, or more capable, of doing that job.